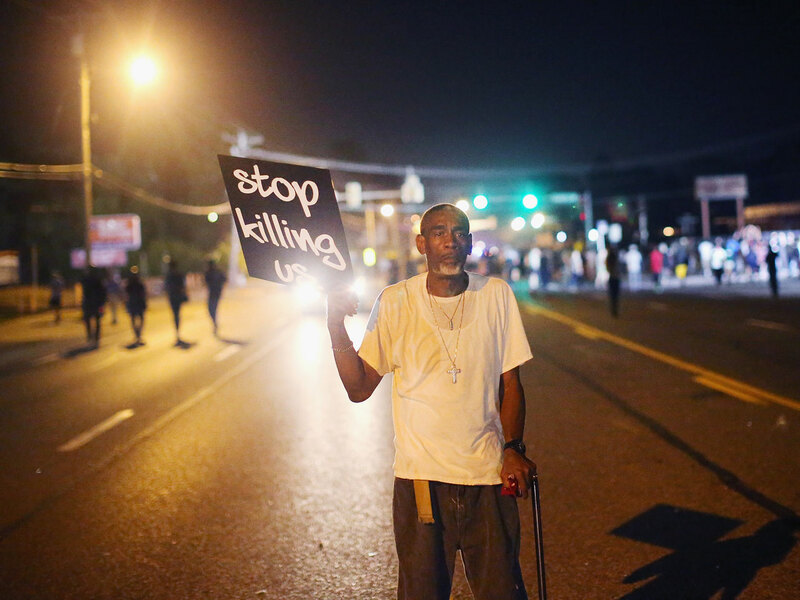 WASHINGTON - For one night, all was well in Ferguson, Missouri. After a change in police command, violent protests decrying the shooting death of unarmed 18-year-old Michael Brown at the hands of white police officer Darren Wilson suddenly gave way to peaceful demonstrations. A day later, Ferguson police, under pressure to disclose Wilson's name, also revealed that Brown was suspected of stealing cigars from a local store before his deadly encounter with Wilson. That announcement was met with disbelief and anger by residents and officials alike, who said local police were trying to smear Brown's name to justify his shooting. Missouri Gov. Jay Nixon told CBS' "Face the Nation": "When you release pictures and you clearly are attempting to besmirch a victim of a shooting, shot down in his own street, a young man, and at the same time you're releasing information ... to tarnish him, then properly, there was a lot of folks that were concerned about that, and I do think it flamed it back up and has caused us to have to deal with some of that." Right after the video's release, the streets of Ferguson exploded anew. Brown's death is the latest illustration of deep divisions between minorities and police that have simmered for generations. Concern about the wariness playing out in Ferguson has coursed all the way up to the White House. President Barack Obama said Attorney General Eric Holder would go to Missouri this week to check on the independent federal investigation into Brown's death. "In too many communities around the country, a gulf of mistrust exists between local residents and law enforcement," the president said. Mr. Obama has been forced to comment several times on that mistrust throughout his presidency. Famously, in 2009, he said that a Cambridge, Massachusetts, police officer acted "stupidly" when they arrested Harvard professor Henry Louis Gates, Jr., who is black, in his own home. The president used the incident to talk about the history of racial discrimination by law enforcement in the U.S. The story of Mr. Obama's remarks exploded, and to tamp down the polarized nature of the national discussion, the president proposed a "beer summit" at the White House with Gates and the officer who arrested him, Cambridge police sergeant James Crowley. The depth of this distrust becomes obvious in polling. While the unrest was occurring in Missouri, almost two-thirds of blacks - 65 percent - surveyed by the Pew Research Center said police went too far in their response to the Ferguson protests, while one-third of whites agreed and nearly another third said the police response has been about right. The Pew survey was conducted Aug. 14-17. Gallup polling between 2012 and 2014 showed that a majority of blacks, or 64 percent, had only some, very little or no confidence in the police, while the majority of the whites questioned, or 58 percent, had either a great deal or quite a lot of confidence in the police. Between 2009 and 2011, Gallup found 61 percent of blacks only had partial or no confidence in police, while 62 percent of whites had a lot of confidence in the police. A factor that breeds distrust is racial disparities between police and the communities they serve. Ferguson is nearly 70 percent black, while the police department is more than 90 percent white. Distrust is also fueled by a perception of unchecked police violence through the ages: the 1992 acquittal of four white Los Angeles police officers in the beating of black motorist Rodney King; the 1967 beating in Newark, New Jersey, of cab driver John Smith; Miami in 1980, after the acquittal of six white police officers in the beating death of black motorcyclist Arthur McDuffie; Cincinnati in 2001 after 19-year-old Timothy Thomas was shot and killed by a police officer. Rioting followed each of these cases. "More African-Americans and Latinos believe police stop people without due cause, use excessive force and engage in verbal abuse than white Americans," said Ronald Weitzer, a George Washington University sociology professor who has studied race and policing in the U.S. and internationally. "So they not only tend to see the police as having some racial biases, but also in their day-to-day activities behaving in ways that are more obtrusive and maybe unjustified in dealing with citizens." Brown was shot multiple times by Wilson on Aug. 9. Police have said little about the encounter, except that it involved a scuffle in which Wilson was injured and Brown was shot. Witnesses say Brown had his hands in the air as the officer fired multiple rounds. Tensions boiled over after a candlelight vigil the next night, as looters smashed and burned businesses, while police fired tear gas and smoke bombs. Capt. Ron Johnson of the Missouri Highway Patrol, who is black, was placed in charge of security, a move that was cheered in Ferguson. He ordered his officers to abandon the body armor and gas masks and instead ensure the public's right to peaceably assemble. What does Michael Brown's shooting say about race in America? But things escalated again Aug. 15, after Ferguson police released Wilson's name along with video they said showed Brown robbing a store shortly before he was killed. Brown's family condemned the revelation, with lawyer Anthony Gray calling it a "sideshow." Weitzer described several different forms of police behavior that breed distrust, particularly among black and Latino males. That included unwarranted stops of individuals on the street by police, such as New York police's highly-criticized "stop-and-frisk" tactic, he said. That particular tactic has come under renewed public criticism after a black man on Staten Island died following being put in a chokehold by a white officer while being arrested him for selling cigarettes illegally. Although the St. Louis County medical examiner has conducted an autopsy, Brown's family ordered their own. It found that Brown had been shot at least six times, twice in the head. Family attorney Benjamin Crump said Monday that Brown's parents "could not trust what was going to be put in the reports about the tragic execution of their child." The Justice Department, already "deeply concerned" about use of military gear in Ferguson, planned to conduct its own autopsy. Without directly referencing the video revelation, Holder said he was troubled by "the selective release of sensitive information" surrounding Brown's case, and said his agency would preserve the integrity of its investigation, "no matter how others pursue their own separate inquiries." "This is a critical step in restoring trust between law enforcement and the community, not just in Ferguson, but beyond," Holder said.